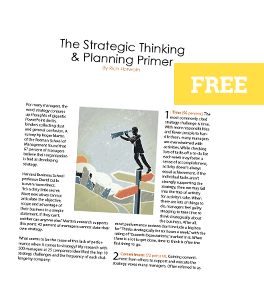 Take a close look at your organization’s strategy. Is it truly a strategy? Or is it a goal masquerading as a strategy? When Yahoo and Microsoft announced their web-search deal, Yahoo CEO Carol Bartz said, “Our strategy as a company is growing audience and enhancing our display-advertising business. That is what really makes sense.” What really doesn’t make sense is that Ms. Bartz identified their goals as their strategy. The subtle distinction between goals and strategy can be the difference between market leadership and a million-dollar oops.